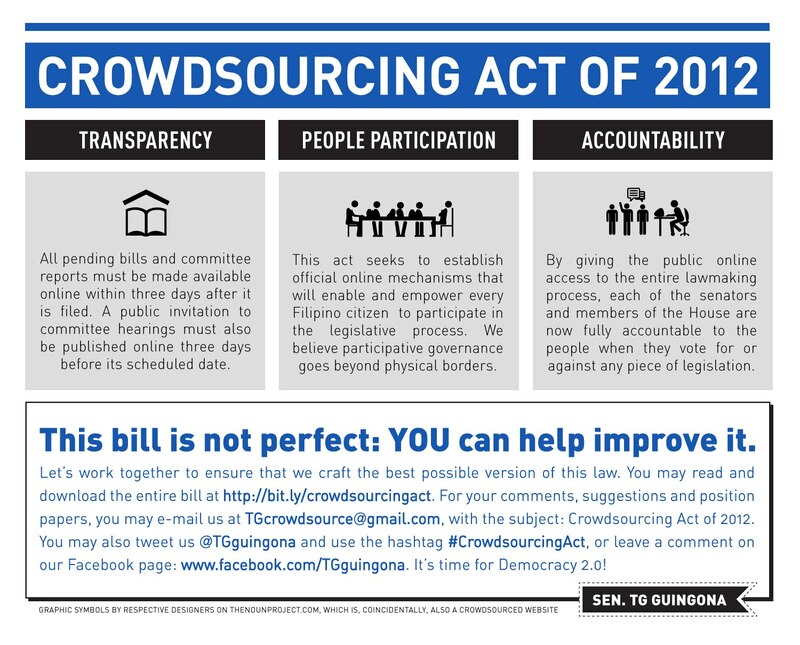 Interesting development in the Philippines: The Crowdsourcing Act of 2012 introduced by Senator TG Guingona, the lone dissenter in the passing of the Cybercrime Law. The Senator is asking for comments, acknowledging that as a first draft, this bill is far from perfect. So here are my three thoughts on this: will comments be actionable, will there be an offline component, and in what kind of ecosystem will it live? 1. Great that people would be able to comment on bills – they already do anyway, so formally including this process in legislation is a recognition of the value of online and social conversations. But as to how the comments will be fed back to the legislation process and how actionable would people’s feedback be is not yet very clear to me. Case in point: the Cybercrime Law. Overwhelming criticism has been levelled against it yet President Noynoy Aquino still insists there’s nothing wrong with it. What would actually be done with the feedback; what mechanisms will ensure that government will not end up just collecting comments, and instead, duly act on them? 3. Crowdsourcing thrives in an open political and cultural system. Can the Philippines overcome its political and cultural barriers to open leadership and e-democracy? On one hand, social media penetration among Filipinos is higher than normal compared to the global average, but access to the Internet by majority of the Filipinos is still a major issue. On the other hand, you have laws like the Cybercrime Law and its provision on online libel, which endangers freedom of speech and will stifle critical and creative conversations.